The Irish Farmers Journal team will be covering all parts of the country for a busy weekend on the pedigree circuit. Kickstarting a busy weekend on the pedigree scene, the Irish Angus Munster branch will be hosting the autumn premier sale in Kilmallock on Friday 9 November. Pedigree editor Shane Murphy will be on hand, reporting on how the sale goes for the 17 heifers and 10 bulls on offer. The show kicks off at 5pm, with the sale at 6.30pm. Further up the country, suckler and beef editor Adam Woods will be in Elphin on Friday night at Martin O’Connor’s annual sale of continental in-calf heifers. The sale consists of 45 lots and always proves popular among farmers. This one gets going at 7pm. Moving on to Saturday and first up is the Irish Charolais Cattle Society’s elite heifer sale in Tullamore. This sale consists of 85 export-tested heifers. Last year's sale topped at €14,500. The pre-sale show starts at 10am, with the sale at 12.30pm; Anthony Mulligan will be present here. Over in Roscommon Mart on the same day, the Irish Shorthorn Cattle Society hosts its premier autumn sale. This sale stands as the pinnacle of the Shorthorn calendar, attracting some of the year’s top prices. A total of 43 heifers and 13 bulls will be on offer for prospective buyers. Shane Murphy will be in attendance covering the Shorthorn premier, before making his way up to Carrick-on-Shannon in the evening to cover the Irish Aberdeen Angus Association's premier sale. This is the third year of the Angus premier. This year, it has attracted 19 bulls and 10 females. Finally, finishing off the busy weekend, the Irish Hereford national calf show takes place in Tullamore on Sunday. This year’s event has attracted a massive 119 entries, with judging kicking off at 10am. For all the live updates, follow FJ_Pedigree on twitter. Quality lots found it easier sold at the recent Aubrac spring sale in Tullamore. 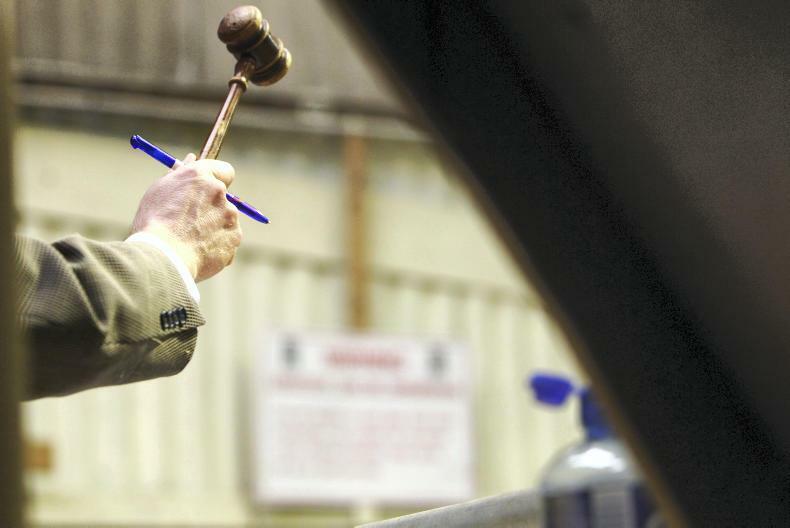 It proved an up and down trade at the Irish Aubrac Cattle Society’s spring sale in Tullamore last weekend. A total of 36 animals went through the ring, with 20 finding new homes. This was an exact split between bulls and females, with 10 of each finding new homes. While there was no pre-sale show, those led to the ring and better presented tended to meet a better trade on the day. The prime example of this was the top-priced animal Ballyconneely Napolean, which sold for €3,050. 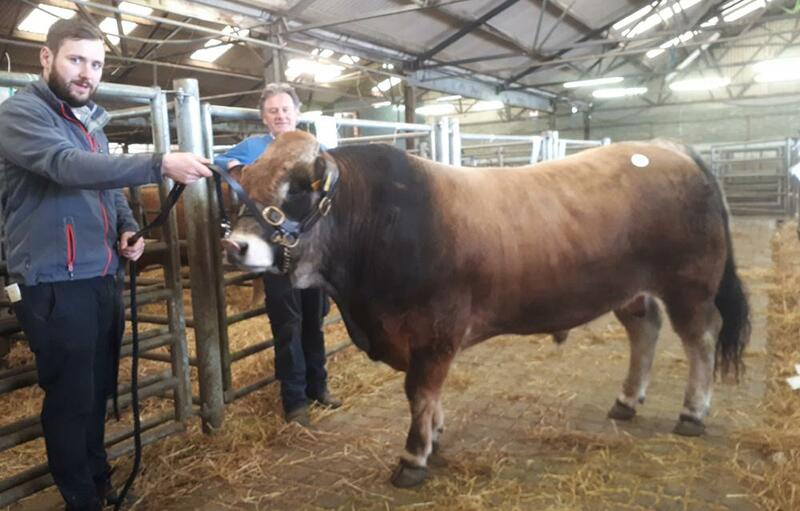 Bred and exhibited by Sean and Terence McSweeney, this stylish bull was the reserve pick for last year’s Gene Ireland programme. His sire was the famous AI bull Dolby. One of two bulls to hit the €2,500 mark was Turloughmore Ninja. This bull, bred by Kevin O’Brien, boasts a replacement index of €209 and is sired by French bull Heritier. Thomas Pollard saw his two lots sell for €2,500 and €2,450 respectively. Hitting the €2,500 mark was Grawn Mr Larry, a son of French AI bull Hussard, with Nipon in the back breeding of the dam. Grawn Neddy, sired by the aforementioned Dolby, hit the market at €2,450. Top of the females was Omaunmore Maxi 0792, from Martin Bermingham, Barnaderg, Co Galway. Another by the successful Dolby, she is out of Dreylands Evie. Maxi was knocked down at €2,400. Not far behind, Mr Birmingham sold his second exhibit, Omaunmore Mia 1498, for €2,300. Mia is a daughter of the successful AI bull Roussel. Tipperary Murty, bred by James Ryan from Doon, Co Limerick, sold for €2,200. Sired by Montrozier 8197, the dam’s lineage contains Causse Ureinou. Nigel Gill sold two females. First up was Tuloughmore Lady, which hit the market at €2,050. She is sired by JL Batifol Obelix, with the dam’s breeding containing Crueize Ramel. The second offering, Yenoh Cottage Nova, didn’t meet the same highs and was knocked down at €1,500. This young heifer is a daughter of Cesar, with the dam sired by Obelix. The Irish Aubrac Cattle Society will host a dairy beef seminar next week, Wednesday 24 April, in Corrin Mart, Fermoy. The seminar will encompass various speakers from across the sector, with stock on show from the different markets. Kicking off at 7.30pm, the event is also KT-approved. The recent Hereford sale in Nenagh saw half of the 28 bulls forward finding new homes. 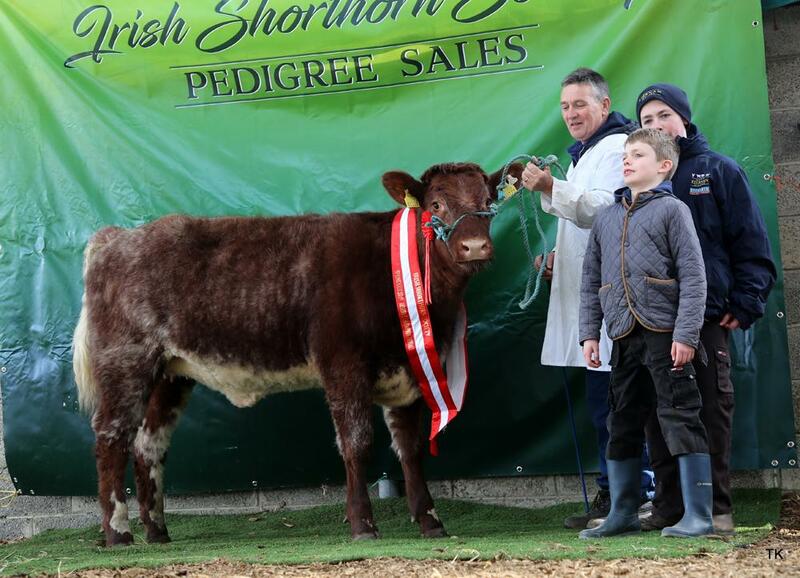 The Irish Hereford Breed Society held the first of its Nenagh bull sales over the weekend. Trade remained tough throughout, with the clearance rate hitting 50%. Average remained nearly on par with last year, settling at €2,350. However, there were some highlights, with bulls reaching as high as €3,000. This was achieved by local breeder Rory Farrell, Toomevara, for his bull Ballinveney United 2. This November 2017-born bull is homebred on both sides, with the sire Ballinveney Nigel. With five stars on the terminal index and four on the replacement, United carries a calving index of only 4.8%. Mr Farrell also had a good day in the show ring with his second exhibit Ballinveney Utube tapped out as overall champion. This October 2017-born son of Steil Gerard goes back on Bowmont Storm-bred dam Ballinveney Pier. Despite his championship rosette, Utube failed to meet his reserve and left the ring unsold. Ivor Anderson was next in line when he sold his first entry, Corran Hill Email, for €2,650. This five-star son of stock bull Glaslough Levi carries a calving figure of 4.1%. The second offering from Mr Anderson, Corran Hill Empire, sold for €2,550. This stylish five-star bull was another by the herd’s stock bull Levi. A further four bulls traded at €2,500. First up was the first bull into the ring Ardmulchan Native. This two-year-old was bred by Philip Smyth and secured a red rosette in the pre-sale show. Sired by UK-bred stock bull Church Preen Gallileo, he goes back on a Westwood Uplifter-bred dam. Matching him was Rathkenny Quercus from Richard and John Lawlor, Clonmel, Co Tipperary. This bull is sired by homebred Rathkenty Okavango and out of Allowdale Dowager. Padraig McGrath was the last to hit that money, twice. Firstly, with Kye George, and then directly after with Kye Harry. Both December 2017-born bulls, George is a son of Trillick George while Harry is a son of Free Town Hotspur. 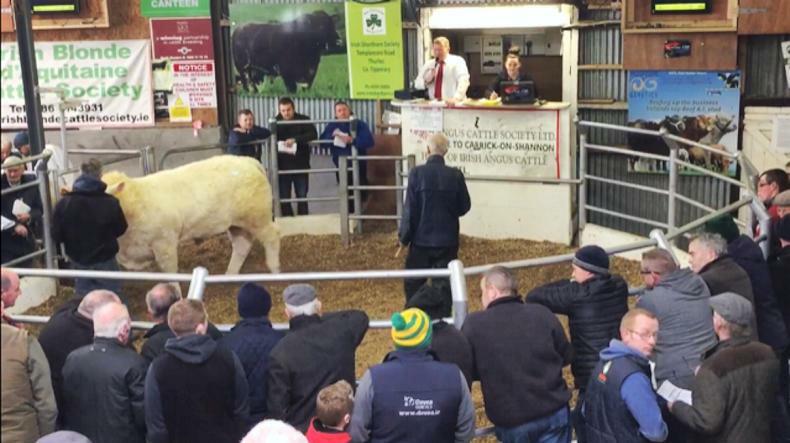 It proved a tough trade in Roscommon for the Shorthorn spring sale, but some of this can be attributed to the quality on offer. The Irish Shorthorn Cattle Society hosted a spring sale in Roscommon over the weekend, achieving a clearance of under 60%. An average yard of cattle was met with average prices, with both males and females settling at €1,600. The breed generally enjoys good prices for females, but last November’s premier sale in the same location looked to have taken the stronger better-quality heifers, leaving a yard of lesser quality for last weekend. However, there were some highlights, in particular the sale of the overall female champion Rockville Lucy 425. This stylish young heifer was brought out by long-time local exhibitor Anthony Dockery. Sired by former show bull Bushypark Ultra, she is out of Dovea Leader 2nd daughter Gavan Lucy. Securing the champion for the top sale price of €3,000 was Genevieve and Mark Cox. Standing reserve in the female championship and selling for the second-top price was Ardnaskea Dreamer. This roan heifer from Clare breeder Patrick Hehir is sired by Coolvin Dominator and out of homebred Ardnaskea Angel 4th. With five stars on the replacement index across the breed, Dreamer was knocked down to new breeders Thomas and Luke Gibson at a price of €2,100. Thomas Fox sold a number of lots at the sale, topping at €2,000. This price was paid for the second-prizewinning Bethlehem Patch 3rd. With five stars down the line, Patch 3rd is homebred on both sides, with the sire Bethlehem Breeze and dam Bethlehem Patricia. Claiming the overall male championship on the day was Michael McKeon with Moygara Lord. Born February 2018, this dark red bull carries five stars on a number of traits, with a calving ease figure of 3.9%. Sired by the herd’s stock bull Ballylinney Eagle, he is out of the homebred cow Moygara Camellia. Having failed to meet his reserve, Lord left the ring unsold. Taking the reserve male championship and top male price was Lismacool Cracker 273. This roan bull, exhibited by Padraig Flanagan, is a son of Brickeens Smasher and Lismacol Jenny. With four stars on the replacement index, he was knocked down at €1,700. Heifers on the day ranged from €1,100 to €3,000 with 12 sold, while only two of the four bulls present sold to average €1,600.